Today is a winter day, a sit by the fire, sipping Irish coffee day. 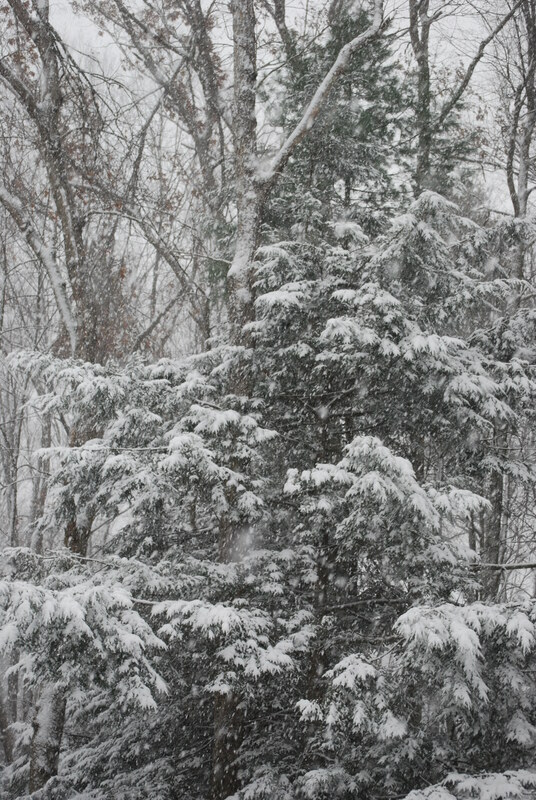 This is what I am doing right now: sitting by the fire, sipping a warm drink, watching the snow whirl outside. Fresh clean snow is transforming the backyard. 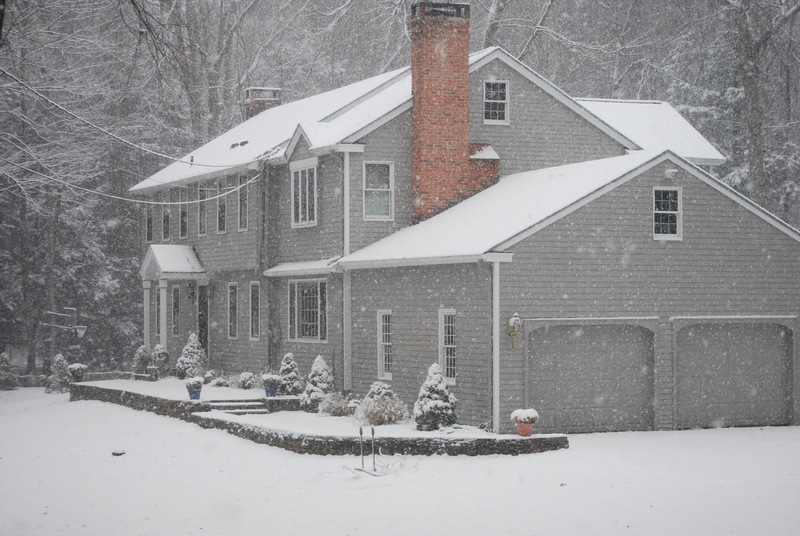 This is the first snow of the season, the first snow in our Connecticut house. This morning started dreary. Yesterday the frost sparkled in the sunlight. On my errands, I drove over to the Pickin Patch to buy winter squash, potatoes, and apples. The sign said that chard (along with collard greens and kale) was still available in the fields. 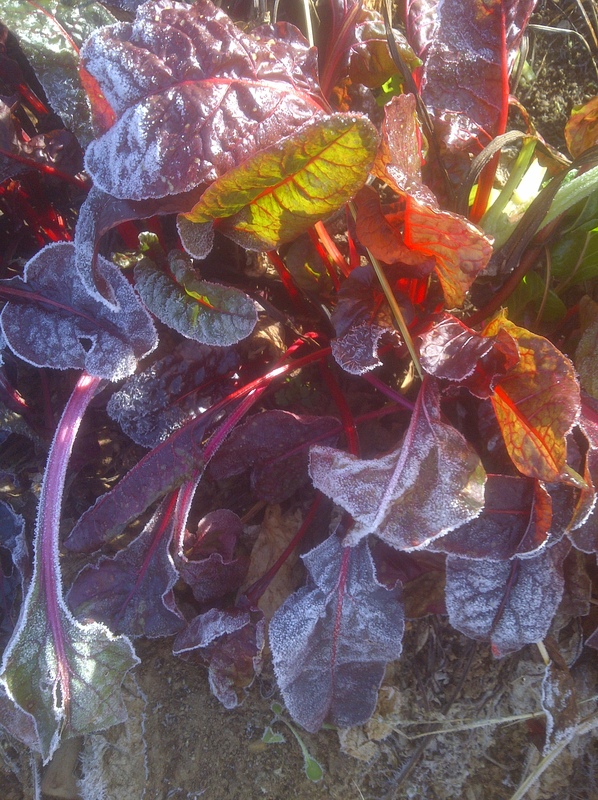 Fresh chard would be a great addition to my bean soup so I asked for a bag and then tromped out to the fields. Frost still clung to some of the leaves. My hands got cold. My fingers were wet and numb. If I was a farmer in colonial New England, I would be worried about bringing in that crop. I watched a flock of ravens scavenge among the leftover pumpkins in the next field. This felt like fall in New England. But today was dreary. The sun didn’t shine. The coffee pot was empty as soon as the machine was done. I started bean soup in the crockpot before I ran two miles with Dude and Peanut. Princess and the beagle refused to leave the house. I cleaned up and went to the town library where I volunteer in the history room. There I checked and labeled some archival boxes. I copied an article on a 98 year old cider mill that was closing and then filed it. Then I proofread articles for the historical society newsletter. Just as I started to read one on horse drawn bobsleighs, my fellow volunteer exclaimed: “Look at that!” Out the window large snowflakes gently drifted. “Time to go,” she announced. And like that, she was gone. I scraped the snow from the back, front, and driver side windows. I should have done the passenger side window as well. 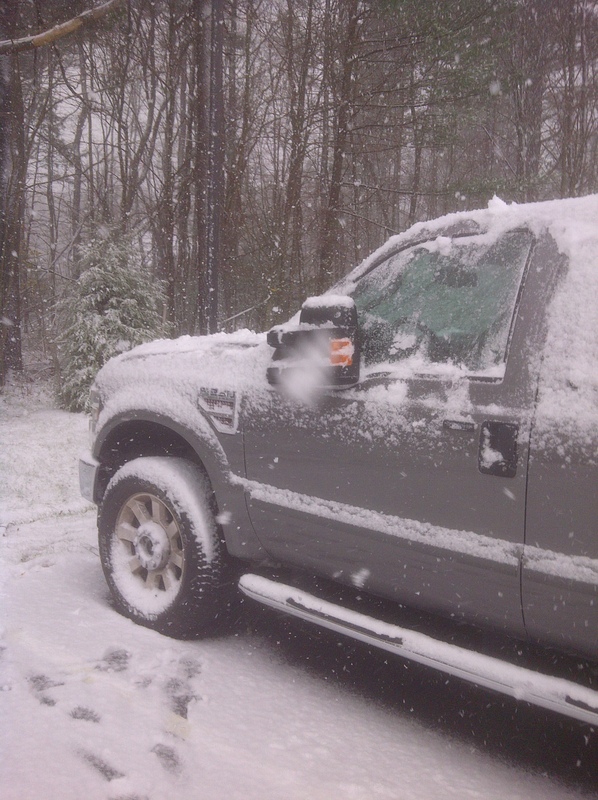 I start to back out, the truck groaned. I forgot to release the emergency break. Laughing at my nervousness, I drove home. No one had driven down my street since the snow started. 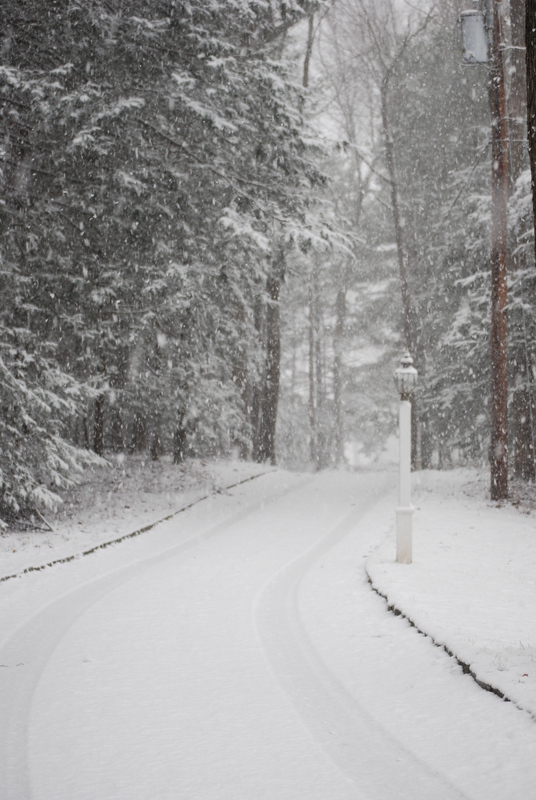 My driveway looked like a postcard. My home beckoned, snug and warm. The dogs were hesitant about going out in the snow. Do they remember last February? Last winter they lived in the kennels where an indoor accident was simply hosed down. 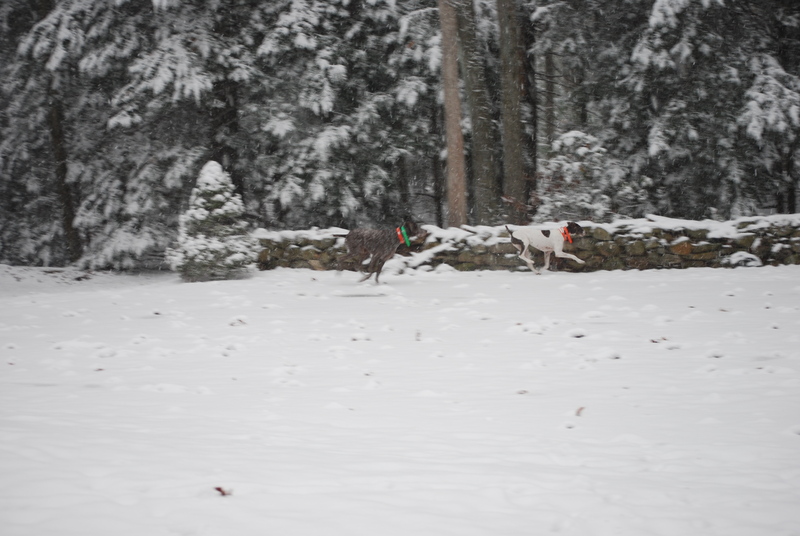 Today the female pointer bounded off the stairs and raced to the edge of the woods. The male pointer joined her and they played like two excited kids. The smaller dogs were more hesitant. The beagle tried not to go out at all. Once I got him off the deck, he wandered around the yard, content to explore. 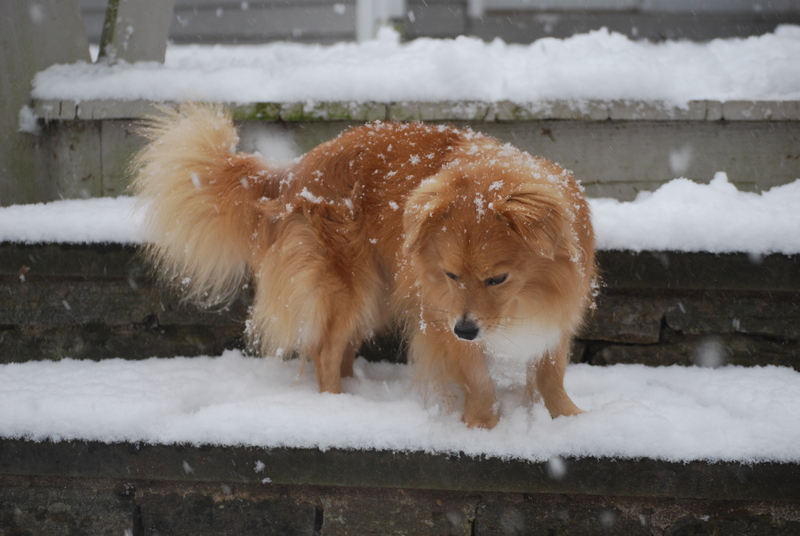 Peanut tried eating the snow. 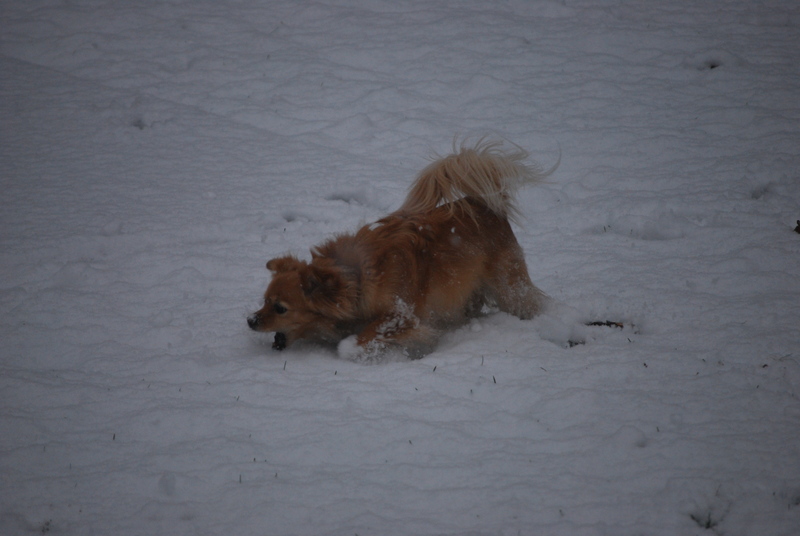 He tried chasing the snow. He got too wet and icy and wanted to be picked up. He is definitely my baby. Buddy couldn’t make up his mind about the snow. The stairs became a challenge for his short little seal legs. I learned dog messes sink rapidly in the snow. 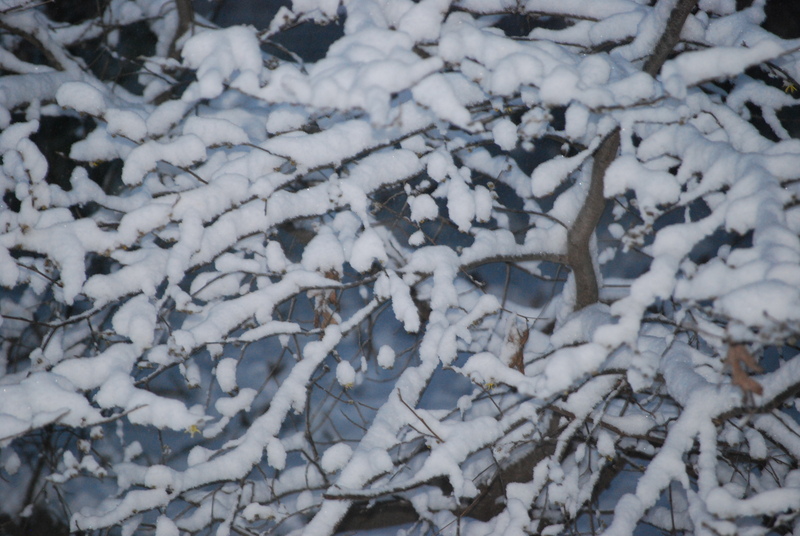 I have to admit, I do find something delightful about the snow. It changes the way the world looks. Sometimes change can be a good thing. As the wind picks up, I sit here wondering if my husband is going to make it down the driveway. A snow blower sits in the garage but it was bought while I was in California a few weeks ago and I have no idea how it works. I’ll find out soon, real soon. 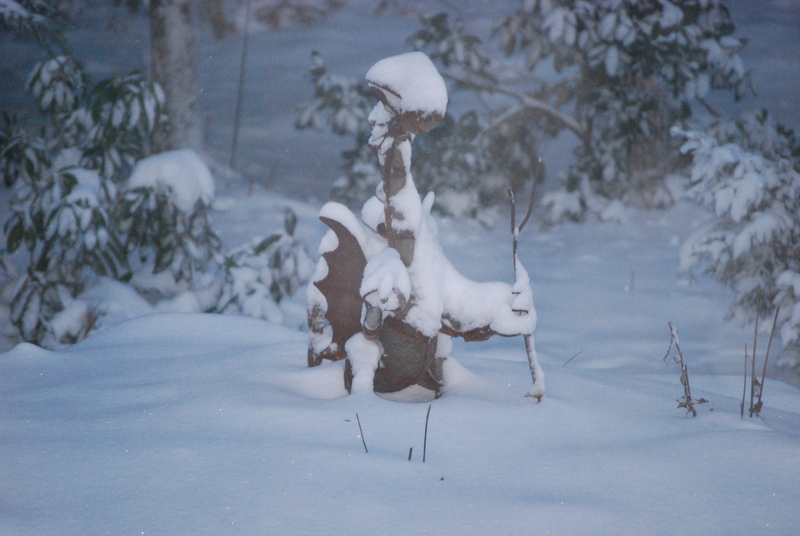 This entry was posted in adventures, backyards, community, dogs, everyday life, Life in Connecticut, nature, New England, snow, storms, Uncategorized and tagged backyards, Connecticut, dogs, home, snow, snowy days. Bookmark the permalink.